Gibson's Tosted Turkey Jerky Dog Treats | All Things Woof Meow, Too Inc.
Our natural, grain-free, USA turkey dog treats are made from high quality, human grade ingredients, and a unique solar powered toasting process that seals in the flavor. Packed in our artful, USA made bags, these soft jerky treats are ready for your dog to enjoy! 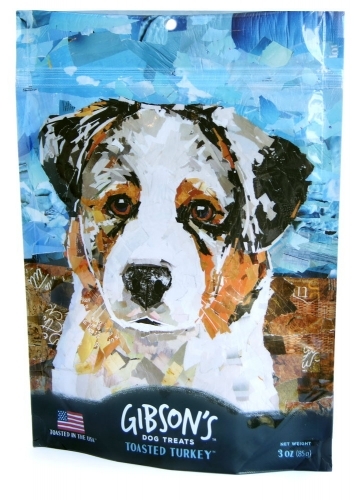 Gibson's dog treats are artfully crafted in small batches with high quality ingredients. We use both solar energy and natural wood smoking to help produce our treats. Whether gently toasted or freeze dried, we go the extra mile to provide a safe treat you can feel confident feeding your dog.